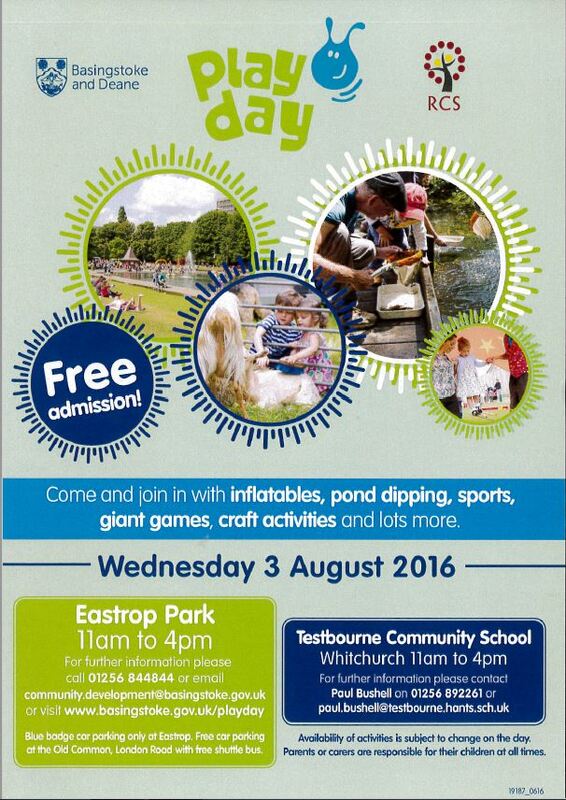 This is the flyer providing more details for this years Playday at Eastrop Park on Wednesday 3rd August (next week!) from 11am to 4pm. If you haven’t seen details about National Playday, it’s a free event for families that happens every year and is absolutely brilliant! I am very, very excited that I will be there on the “Splat the rat” stall. Please come and say hello! Just in case you missed it, (and it’s highly unlikely that you have because I’ve been going on and on about it for the last few weeks! lol) it’s National Play Days today. There are three big events taking place, one in Eastrop Park, one at the Hurst Community School in Tadley and one at Tesbourne Community school in Whitchurch. They are all running from 11am to 4pm. I can’t comment for the events in Tadley and Whitchurch but I’ve been going to the Eastrop Park event for the past three years and it’s been excellent each time, especially as it’s a free event. It looks like there will be several taster sessions going on this year and lots of local businesses will be on show. Miss NHM and I will be attending probably from about 1pm onwards so if you are there then, I hope to see you! I will be wearing my NHM sticker! Have a great day, whatever you end up doing! Thank you so much to Liane who sent these through after seeing my recent post asking if anyone knew anything about the National Play Day events this year. This year’s National Play day is on Wednesday 6th of August. Update: The event in Tadley has already been arranged and you can find more details HERE. The event at Eastrop Park will also be going ahead and you can find more details HERE. For those of you who have never been this is a FANTASTIC free event. We’ve been for the last couple of years and we always have a great time. The whole thing is free and there are usually lots of brilliant activities on. Normally it’s at Eastrop Park and there is free parking near the War Memorial Park. I really hope that this event goes ahead again this year as it’s such a brilliant day out.